A SAD SIGHT for Woonsocket, the word “Closed” is all that is posted on the sign of Darin’s Market. 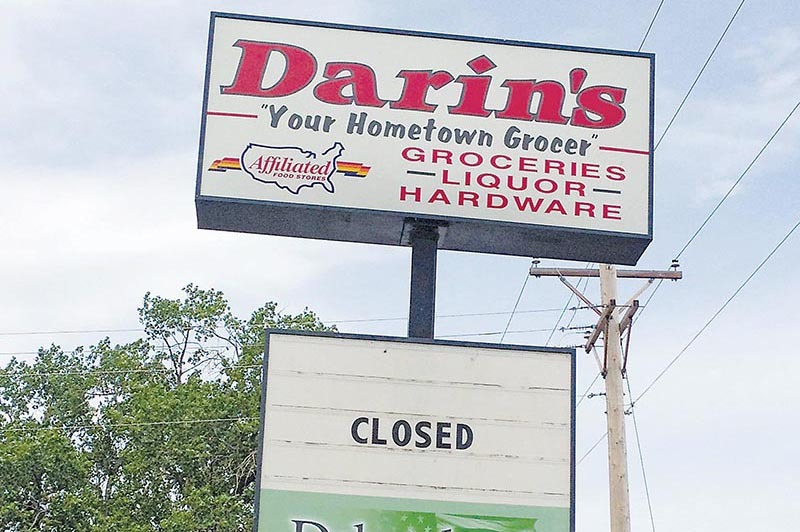 Darin’s Market in Woonsocket closed its doors for good last Friday almost exactly 10 years after announcing they would rebuild a new facility. Darin and Anne Schmiedt of Woonsocket cite low sales versus high cost of operation as the cause of the closure. The couple rebuilt the new store along Highway 34 on the east end of town after their old building on main street burned in an April 22, 2003 fire. They announced their plans to rebuild this week 10 years ago and opened for business in the middle of December 2003. The grocery and hardware store is closed, but Dakotaland Federal Credit Union, which rents a space inside the store, is still open and serving its members. It is unknown at this time what will become of the remainder of the 10,000 square foot space. USPS Postmaster Jacki Aymar of Woonsocket will be retiring this Friday, June 28 after 27 years of service. 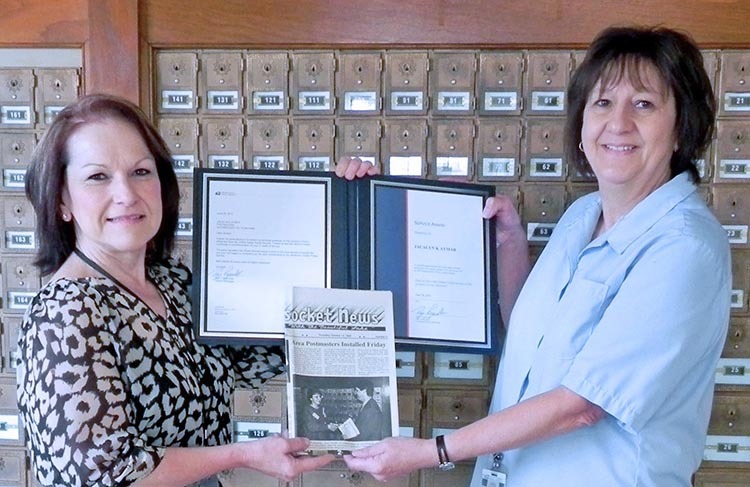 She is shown at right receiving a certificate from Dolly Lund, the acting MPOO (Manager of Post Office Operations) for the Dakotas District. They are holding up the Woonsocket News from 1993 reporting Aymar’s installation as Woonsocket Postmaster. Postmaster Jacki Aymar will retire from her post this Friday after nearly 21 years behind the counter of Woonsocket’s Post Office. Aymar began working for the United States Postal Service in 1986 in Miller as a clerk and later moved on to Canova, where she served as postmaster. In August of 1992, Aymar came to Woonsocket, where she was named the Officer in Charge of the post office, then became postmaster in 1993. Shannon Fiddler, a supervisor from Mitchell, will serve as the officer in charge in Woonsocket until around the end of September, when a new permanent postmaster will be selected. Aymar says she will miss seeing the people each day and she has no big plans for her retirement, other than to spend more time with her grandchildren and on the back of her husband, Greg’s motorcycle. The Aymars intend to remain living in Woonsocket. THE AT&T CELL tower located a mile southeast of Woonsocket bit the dust Friday afternoon during a wind storm. AT&T was unable to give us a timeframe as to when the tower may be replaced. The AT&T cellular tower at the corner of 398th Ave. and 231st St., one mile southeast of Woonsocket was leveled during Friday afternoon’s windstorm. The storm dropped very little rain in our area but created extreme high winds, which caused some damage throughout the county and the state. Those with AT&T cellular phone service are experiencing little to no service in and around Woonsocket as a result of the downed tower. 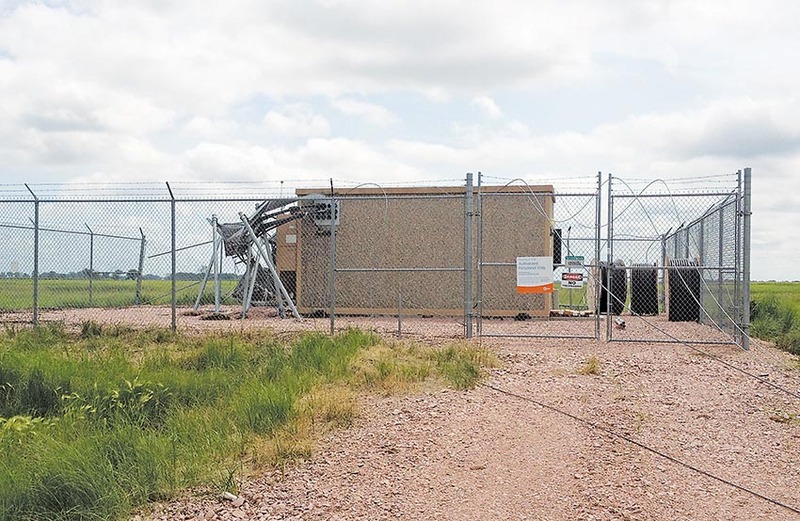 AT&T technical service was unable to give an estimated date as to when the tower would be repaired.